If your kids want more instant gratification from their countdown, try this colorful, modern chocolate Advent calendar from Dylan’s Candy Bar, available at Neiman-Marcus or directly from Dylan’s Candy Bar (compare shipping rates). It’s full of two dozen individually wrapped milk chocolates. Just make sure you get a few of these Advent calendars if you have more than one kid — or if you plan on sampling the treats yourself. Fortunately the price is terrific. 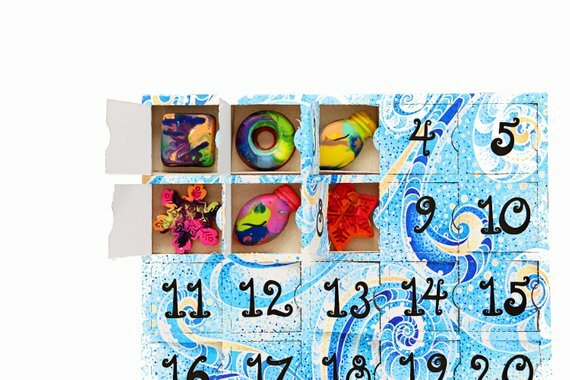 I love that this crayon Advent calendar from our friends at the Art 2 the Extreme Etsy shop offers a brand new handmade rainbow crayon every day, and in the form of classic Christmas shapes (plus a few welcome-in-any-season donuts). This one is ideal if you want to give your kids a daily treat without the sugar. 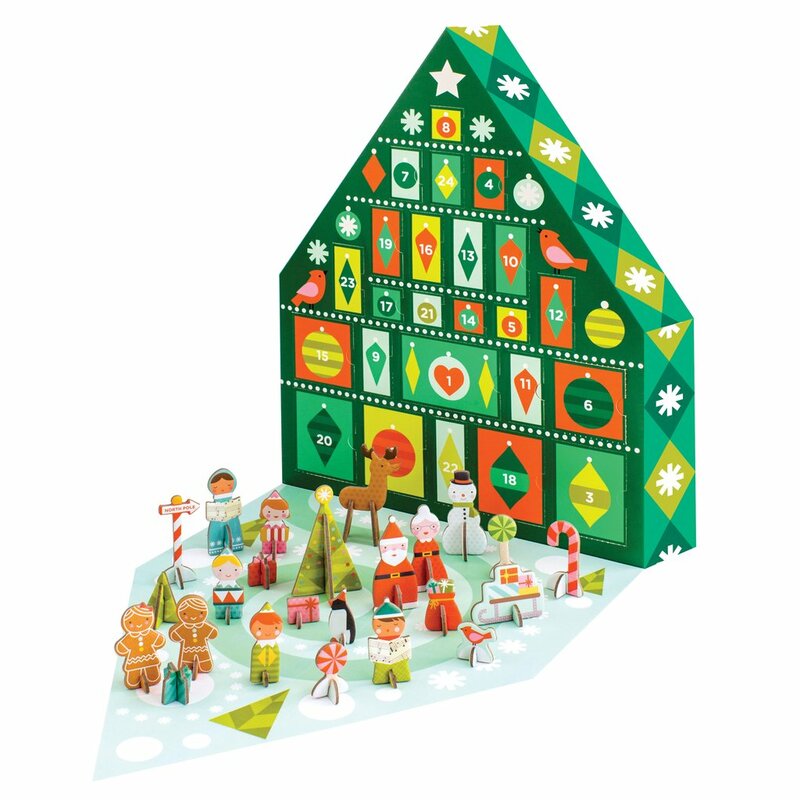 For another creative Advent calendar idea, I think younger kids will love playing with this tree Advent calendar from Petit Collage, which forms a whole tiny Christmas village as the month of December unfolds. And unlike the musical keepsake Christmas villages at Grammy’s house, playing is permitted and encouraged here. 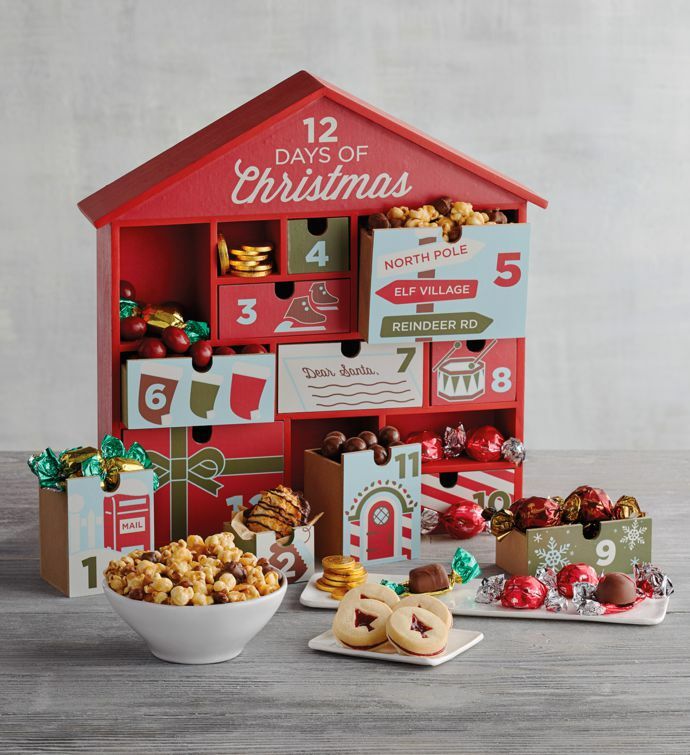 Related: 7 food and drink Advent calendars to make Christmas even more delicious. 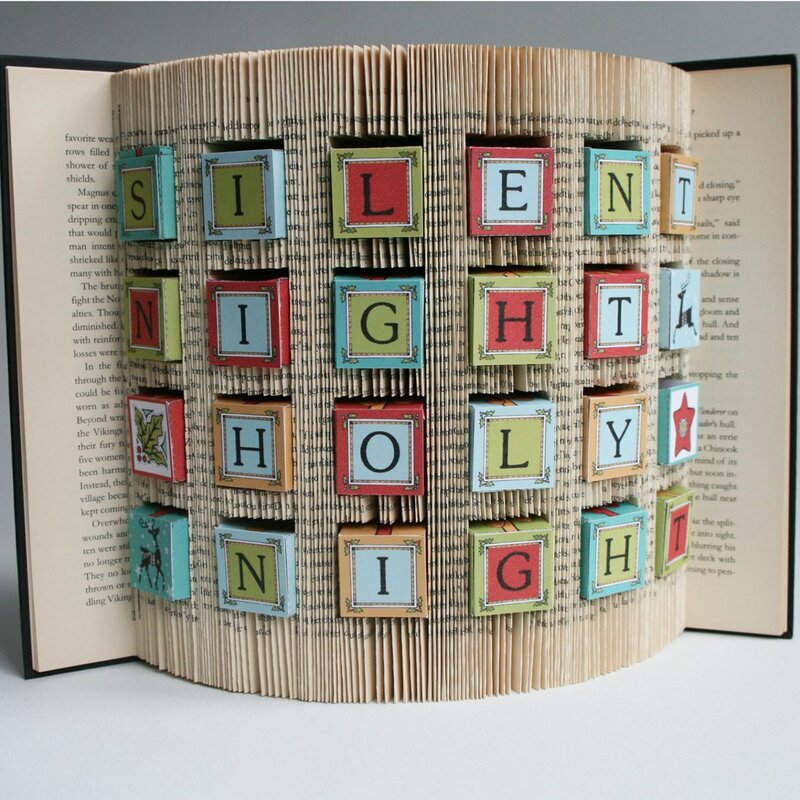 If you’re looking for a creative Advent calendar for a crafty teen or tween, check out this cool DIY book art Advent calendar tutorial at Love Book Folding. It includes the pattern and instructions you’ll need to make a lovely, nerd-tastic calendar like this one. If you want to give something a little more than chocolate each day, it’s tough to pass up 12 days of treats from the gift basket experts, especially when those days bring macaroons, peppermint truffles, and flavored popcorn. Give this Harry and David Advent calendar to your nieces, nephews, or grandchildren, and you’ll be their favorite person. Ever. 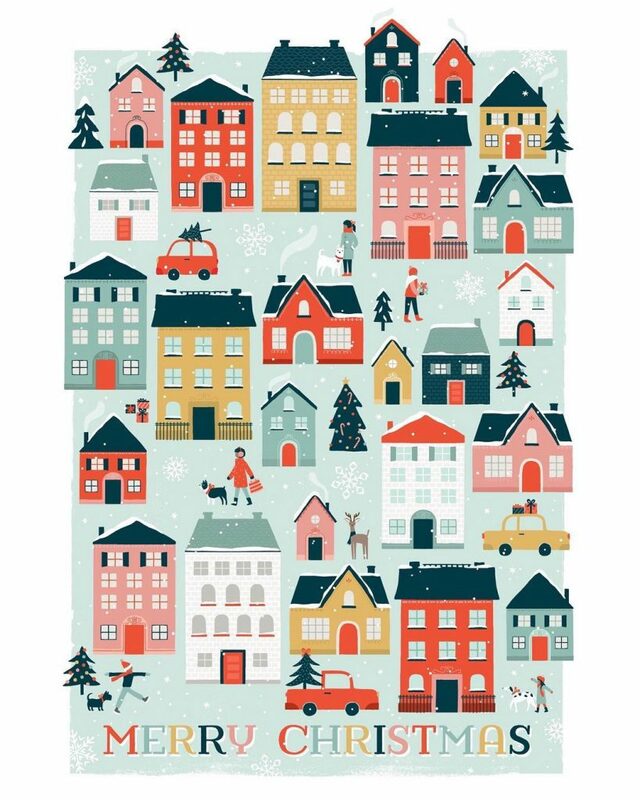 We love everything from our friend Alma Loveland at Caravan Shoppe, and we’re so excited to see this new printable Advent calendar she just created, that we’re sharing it early; it won’t be available for download in her shop until right after Thanksgiving. But since it’s an instant download, how much time do you need, really? 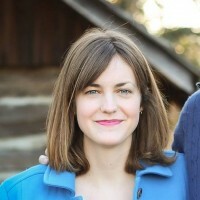 Caroline Siegrist is a brand new mom, a proud aunt of 5, and a writer and hospital chaplain based in Nashville. She has a fondness for children's literature, female-led indie rock bands, cooking international cuisine, and encouraging her nieces' and son's growing obsession with Star Wars.